This is an example of how treating customers right (or at least correcting errors) not only avoids a United Breaks Guitars fiasco: it can actually lead to positive social media buzz. As I reported in October, Meredith Gould is a great humanitarian, having bailed me out by recovering the Flip video camera I left on the podium at a speaking engagement in Philadelphia. She sent it to me via UPS, and said she would let me know the cost when it showed up on her credit card statement. If you think a bill is outrageous, don’t just pay it. Contest it. It may be a mistake. If your business made a mistake, fix it, and you’ll not only avoid the bad word-of-mouth, but will instead get kudos. Fixing a mistake can be better for you marketing-wise than not having made the mistake in the first place. If the UPS bill had been correct originally, I wouldn’t have been the subject of my conversations, much less a blog post. Don’t make mistakes on purpose so you can benefit from fixing them. If you’re systematically overcharging and hoping people won’t notice, it will catch up with you. 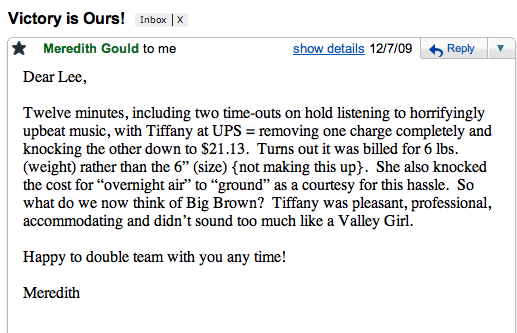 Hire more customer service people like Tiffany, and fewer like Ms. Irlweg. I’m coming up on my two-week anniversary of getting my iPhone, and I thought it would be fun to use my iPhone to take a picture of the devices it is replacing in my coat pocket. On the left is my Blackberry, which had my calendar and email. 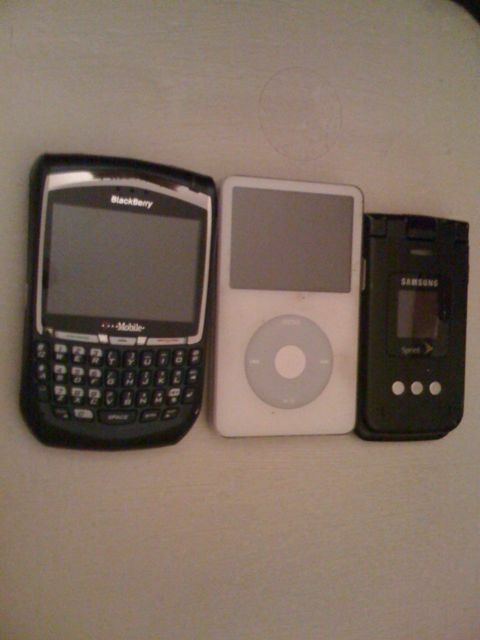 In the center is my 80 gig iPod, which had the advantage of carrying every bit of my music and spoken word audio. On the right is my personal cell phone. I didn’t have a digital camera previously; now with the iPhone I have that functionality. The iPhone keyboard is a little touchier than the Blackberry and is more susceptible to typos, but the smart error correction is pretty nifty. With the Blackberry, Web browsing was possible but intolerably slow for all but emergency situations. I had an interesting experience this week as I was on a phone call using the ear buds, when I got a text message. I returned the text without having to leave the call. That was pretty nifty too. Some people wish the iPhone had a video camera. Personally, as regular readers and all SMUGgles know, I prefer the Flip for video. It has a built-in USB connector for uploading video. The really great thing about the iPhone, though, is its application platform, which enables others to add functions, like the WordPress app I’m using to write this post (and incorporating a photo from the iPhone camera). I couldn’t have gotten the iPhone, though, if it didn’t support Exchange e-mail. This is really well done, and the calendar also synchs automatically. As I do blog posts using the iPhone, I expect they will mostly be less text-heavy than this one. The WordPress app for iPhone is nice for mobile blogging and incorporating photos, but you can’t insert links. So I guess I would need to edit posts later from my computer to add links. Anyway, I’m quite satisfied with my experience with iPhone. And it has been nice to lighten and unclutter my sportcoat pockets. If you have an iPhone, I would love to hear what applications you find most helpful.